Now I know that the film Cloverfield is hardly considered a classic movie. However, it has every component of a classic film in the making. I had a rare lazy Saturday afternoon last week when I sat down and caught the movie on television. I saw the movie when it first came out in 2008, and I do believe that seeing it on the big screen makes more of an impact than to see it on television. However, either way I think Cloverfield is a proud addition to the movie monster drama, and it can stand beside other destructive monsters like Godzilla and King Kong. The film is presented as found footage from a personal video camera recovered by the United States Department of Defense. A disclaimer text states that the footage is of a case designated "Cloverfield" and was found in the area "formerly known as Central Park". The video consists chiefly of segments taped the night of Friday, May 22 and the morning of Saturday, May 23. The newer segments were taped over older video that is visible occasionally. The first video segment opens when Rob wakes up on the morning of Monday, April 27 having slept with Beth, a previously platonic friend. They make plans to go to Coney Island that day. The footage suddenly cuts to May 22, when Rob's brother Jason and his girlfriend Lily prepare a farewell party for Rob who will be moving to Japan. At the party, their friend Hud uses a camera to film testimonials, and flirts unsuccessfully with Marlena, another party guest. 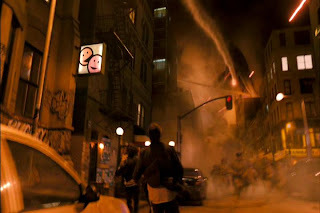 After Beth leaves the party following an argument with Rob, an apparent earthquake strikes, and the city suffers a brief power outage. The local news reports that an oil tanker has capsized near Liberty Island. 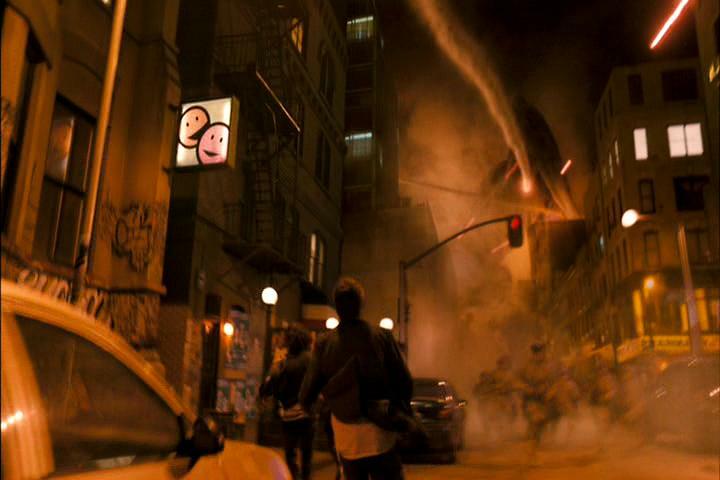 Then another explosion causes the party-goers to evacuate the building. They see the head of the Statue of Liberty crash nearby in the street, with several stunning scratch and bite marks. Hud records what appears to be a giant hand of a creature several blocks away. Rob, Jason, Lily, Hud and Marlena, along with a crowd of other civilians, attempt to escape Manhattan on the Brooklyn Bridge. A gigantic tail comes down and destroys the center span of the bridge, killing Jason and others. The survivors flee back to Manhattan as the bridge collapses. Rob discovers that Beth sent him a message and goes to an electronic store trying to get new batteries for his phone. Hud watches the news, which shows the United States Army's 42nd Infantry Division attacking the monster and smaller "parasite" creatures falling off its body. Several of these creatures are seen attacking soldiers and civilians on the ground. Once Rob gets new batteries, he listens to Beth's message saying she is trapped in her apartment and unable to move. Going against the crowd, Rob, Hud, Lily, and Marlena venture to Midtown Manhattan to rescue Beth. They are soon caught in a crossfire between the monster and the military, and escape into a subway station. They walk through the subway tunnels but are attacked by several of the "parasite" creatures. Hud is nearly dragged away, and in the process of saving him, Marlena is bitten by one of them. They escape to a small room and come across a Bloomingdale's department store where they are met by a squad of soldiers who have set up a field hospital and command center in the store. As Rob tries to get assistance for Beth, Marlena dies. One of the military leaders lets the rest leave but tells them when the last evacuation helicopter will depart before the military enacts its "Hammer Down Protocol". The group goes to Beth's apartment tower at the Time Warner Center, which has collapsed against the center's other tower. They rescue Beth, who was trapped and impaled on a piece of rebar. The four try to make their way to the evacuation site, where they encounter the monster once more over Grand Central Terminal. Lily is raced into one departing U.S. Marine Corps helicopter. Moments later, Rob, Beth and Hud are taken away in a second helicopter and witness a U.S. Air Force B-2 Spirit bomb the monster. The monster falls. Just as Hud declares victory, the monster lunges and attacks the helicopter, causing it to crash into Central Park. The creature before attacking Hud. The film skips to less than an hour later, with a voice on the crashed helicopter's radio warning that the Hammerdown protocol will begin in 15 minutes and states that anyone able to hear the sirens is within the blast zone. The three friends have regained consciousness, but the helicopter pilot and the soldiers with them have not. Hud and Beth pull an injured Rob from the helicopter wreckage. Then Hud recovers the camera. The monster appears over him. Hud watches the monster in terror, and after a moment the monster lunges at Hud and kills him. 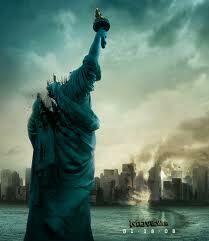 As a little end note, there are talks for a Cloverfield 2, and hopefully it will happen soon. The movie changed the way modern movie monsters are portrayed and viewed on the screen.